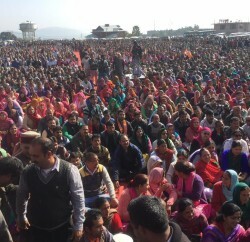 Himachal BJP General Secretary Ram Sarup Sharma has alleged that the economic and social welfare policies pursued by the Congress led UPA government have made the life of the common people miserable. Even the cost of cremation has gone beyond the reach of the common man but he has to put up with it as a one-time ‘luxury,’ he remarked. Sharma ridiculed the Congress government declaration that a person who can afford to spend Rs. 30 a day in urban areas and Rs. 26 in rural areas is not a poor. BJP General Secretary challenged the economist Prime Minister Dr. Manmohan Singh, Finance Minister P. Chidamabaram and Planning Commission Vice-chairman Montek Singh Ahluwalia to present a model budget for persons living below the poverty line so that they can have a healthy and nutritious food. Sharma alleged that the narrow thinking of Congress government that is responsible for rising deaths among the poor, lactating mothers and infants/children because of malnutrition. 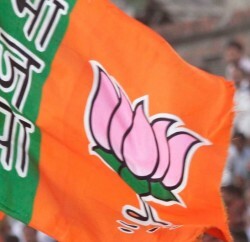 Sharma said that the present BJP government has provided subsided atta, rice, daal, salt, vegetable oil etc., even to APL families, whereas on the contrary, UPA Govt had reduced the quota of rationed foodgrains from 18500 metric tonnes to 7000 metric tonnes, of sugar from one Kg per head to 550 grams per month, of kerosene oil from 5411 to 2000 kilolitres. 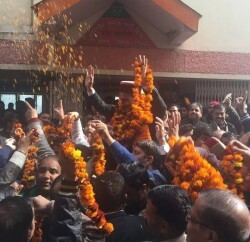 Ram Sarup Sharma claimed that Himachal government was providing atta at the rate of Rs. 8.50 per kilogram, rice at Rs. 3 to BPL and Rs. 10 to APL families, urad daal at Rs. 35, chana daal at Rs. 25 and gram at Rs. 25 per Kg and sugar at Rs. 13.50 at almost half the prices prevailing in the market. ALL THE ABOVE PARTIES CHANGE THE COLOURS AT ANY TIME AND DITCH PEOPLE FOR TOTALLY PERSONAL AND POLITICAL MOTIVE.